Members of the Arkansas Blast who also play for the Bryant Lady Hornets softball team include, from left, Cassidy Wilson, Jenna Bruick, Jesse Taylor and Kayla Sory. The Blast blitzed through the tournament with a perfect record of 10-0 while outscoring their opponents 67-15. In the gold bracket on Saturday, the Blast beat the Georgia Rockers 6-2, the Panama City Lady Lighting 9-1, and the Augusta, Ga., Attack 9-0. The team includes four Bryant Lady Hornets. 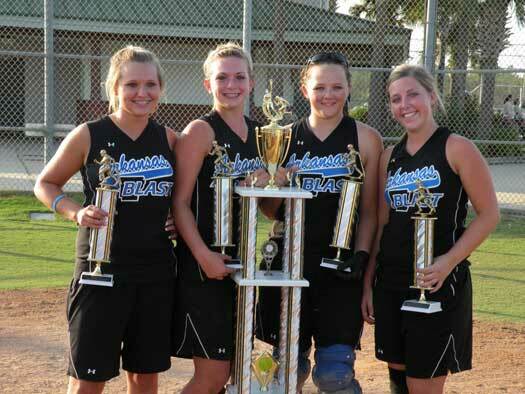 Pitcher/first baseman Kayla Sory, catcher Jessie Taylor, shortstop Cassidy Wilson, and second baseman Jenna Bruick.